The New Orleans neighborhood was among the hardest hit by the storm and levee failures more than a decade ago. Homes undergoing renovation in the Lower 9th Ward (July 2008). Photo credit: FEMA. It’s been thirteen years since Hurricane Katrina hit New Orleans, and the effects are still felt every day. 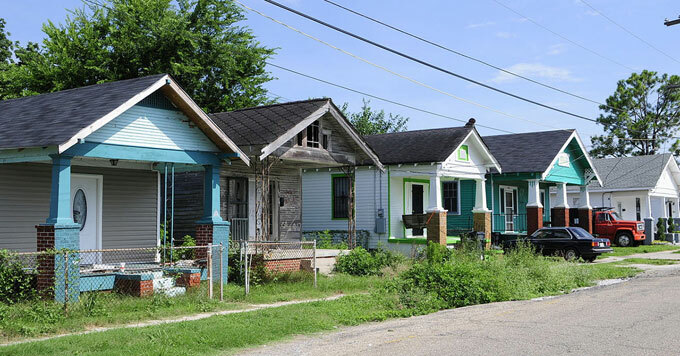 Reverend Richard Bell lives in New Orleans’ Lower Ninth Ward. During Katrina, floodwaters breached the city’s levees, inundating Bell’s neighborhood. Some areas sat in twelve feet of water for six weeks. Bell was able to rebuild his house, but he says there are areas of the Lower Ninth Ward that still look like a wasteland. Climate change is making extreme weather more common. And though the news coverage about any particular storm largely disappears after a few weeks or months, people’s lives are often affected for years to come.